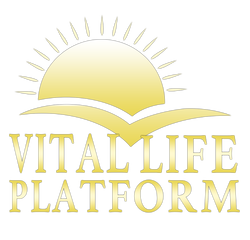 One On One - Vital Life Platform | Better Than Ever! 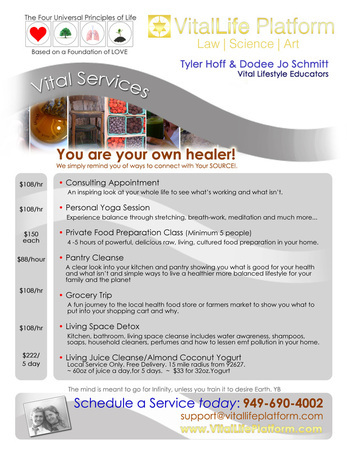 If you are looking for a more in-depth, one on one connection with us on how to integrate the Four Principles of Life and learn some incredible ways to enhance the quality and integrity of your life naturally, then call us today to set up an appointment, via phone or in person. Get a better sense as to what you can do to get clear on how to live a radiant, healthy, vibrant lifestyle. You will get essential tools to help accelerate the cleansing and healing process that your body knows how to perform naturally. You will learn how to begin to culture your foods to make them predigested, and how to prepare them in very powerful and delicious way - allowing them to be absorbed into the system easily to build lean muscle, hair skin and bones. You will also learn methods of detoxification to begin purifying your blood, cleansing your bowels and clearing your heart and mind.